Automotive Engines produce a great amount of heat during the combustion process. Therefore, it is essential for automobiles to employ cooling systems to avoid engine damage. Automotive cooling systems consist of various components such as cooling fan, pump, radiator, and so on. 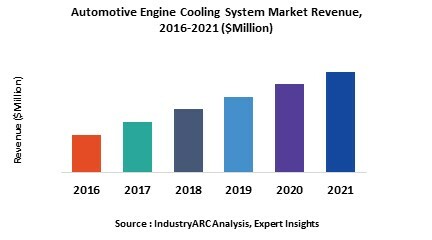 Increasing vehicle production globally owing to the growing demand is set to boost the automotive engine cooling system market. The market is projected to grow at a CAGR of 4.8% during the forecast period 2018–2023. The cooling system is a critical part of an automobile engine. It removes excess heat from the engine and maintains the efficient operating temperature for the engine. Thus, the automobile cooling system keeps the engine running at an optimum temperature irrespective of the operating conditions. Automobile cooling systems consist of components or equipment installed in vehicles for dissipating the heat from all the parts so that they can operate without the risk of melting, seizing and overheating. An automotive cooling system makes use of a coolant, lubricating oil and fan to maintain and regulate the temperature of other parts of an engine. The market for these components is estimated to witness growth as the global vehicle production is increasing. However, the recent slowdown in key markets such as Brazil and Russia may affect the demand for automobile cooling systems. The shifting trend towards light and small automotive engine cooling systems will open up significant opportunities for manufacturers. Furthermore, the use of vehicles has increased significantly in urban areas, where the engine is mainly operated in part-load conditions. The cost of replacing the automotive engine cooling parts is high. Also, there is a continuous fluctuations in the price of components such as radiators, and coolants. These are the key challenges faced by the automotive engine cooling market. The base year of the study is 2017, with forecast done up to 2023. The study presents a thorough analysis of the competitive landscape, taking into account the market shares of the leading companies. It also provides information on unit shipments. These provide the key market participants with the necessary business intelligence and help them understand the future of the Automotive Engine Cooling market. The assessment includes the forecast, an overview of the competitive structure, the market shares of the competitors, as well as the market trends, market demands, market drivers, market challenges, and product analysis. The market drivers and restraints have been assessed to fathom their impact over the forecast period. This report further identifies the key opportunities for growth while also detailing the key challenges and possible threats. The key areas of focus include the types of automotive engine cooling systems, and their specific applications in different types of vehicles. Mahle GmbH, headquartered in Germany, is the major supplier of automotive engine cooling systems. It occupied a market share of 10.4% in 2017. Schaeffler AG is the second largest player in the Automotive Engine Cooling System market. It held a market share of 9.7% in 2017. Some of the other key players mentioned in this report are Borgwarner, Calsonic Kansei Corporation, Continental AG, Delphi Automotive LLP, Denso Corporation, Mahle GmbH, Schaeffler Group, Valeo SA, and Visteon Corporation. DENSO Corporation has developed new eco-friendly plant-derived resin radiator tank using an organic compound derived from castor oil tree. As compared to conventional products, this new radiator releases less CO2 emission and consumes less oil. Manufacturers are now focusing on the production of smaller auto engine cooling parts and towards integration of components. For instance, combining the condenser and radiator could save space and help in cutting down costs. Adoption of hybrid and electric vehicles is increasing across the globe, thereby creating ample opportunities for the growth of the automotive engine cooling market. "*Financials for private companies would be provided on a best-efforts basis "